Layl McDill is a sculpture artist who uses primarily polymer clay with the ancient technique of millefiore to create her pieces. Tiny images cover every surface of her sculptures and inevitably make the viewer wonder “How did she do that?” even though she has been doing it for twenty years, even she is still amazed by the tiny images she can create inside a chunk of clay. 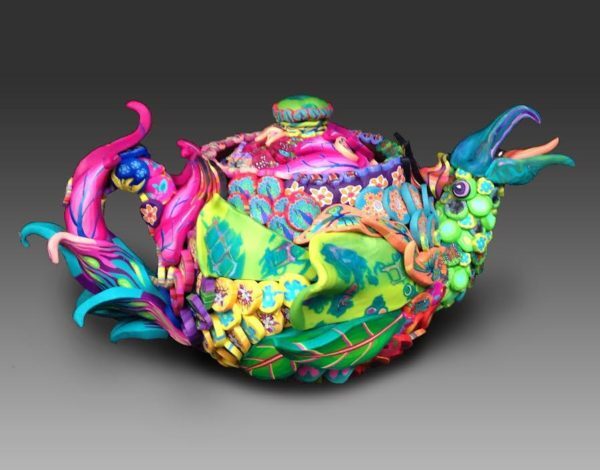 To make the tiny pictures characteristic of her work, she creates large designs in a chunk of clay, using colors which are generally bright and cheery. “My secret weapon is fluorescent pink which is mixed in with other colors to give a zing,” says the artist. She then stretches the design out very slowly (sometimes this can take up to eight hours! ), eventually for the result of producing long strips of clay called “canes” which she slices up to reveal tiny pictures. These tiny slices are then grouped together to create Layl McDill’s sculptures. Layl McDill explains her work in in the Gallery in this way. “Once upon a time each of us was a little kid. Everything was nonsense. We tried to figure it out. We wondered about everything. We wondered what our stuffed animals did at night. Making my art helps me keep this magical doorway to wonderment open.” The artist is drawn to imagery that sparks that feeling of the unknown and mystery, for instance perusing questions like ‘What’s in those cupboards? Drawers? Boxes?’ As McDill is creating work, she is asking all kinds of questions that entertain her imagination and when the piece is complete, the viewer can then start asking questions: ‘What happens next?’ ‘What do all those magic potions do?’ Viewers find themselves in a seemingly nonsensical world, but upon taking a closer look, they start to recognize reality. “Some people come to my work thinking it is great for children, but I really make my work for adults. I make it for everyone that loves to revisit that feeling of wonderment, magic and mystery that we all had as kids,” she says.